Plants should be soaked for a few hours in water or in a weak solution of liquid fertilizer. Remove any decayed or damaged roots. Cut the foliage back to 6 - 8 inches tall. Dig a hole larger than the root mass and incorporate a mixture of compost, good garden soil, peat moss, sand or well- rotted manure. Make a mound in the center of the hole and set the daylily in place with the roots spread on each side. Plants should be set as deep as they grew originally. Work the soil around and between the roots as you cover the plant. Firm the soil, leaving no air pockets and water well. Space the plants 18 to 24 inches apart. Water twice weekly until plants begin to show new growth. WHY GROW DAYLILIES? If you have ever grown daylilies, you are probably familiar with what a great plant they are. For beginners, get ready to fall in love! Daylilies are one of the easiest plants available – hardy perennials that require little maintenance and have almost no problems from pest or disease. And, of course, there is an incredible variety to choose from! Blooms in almost any color, sizes from 2” to 10”, and a variety of shapes – perfectly round, triangular, spiders, and doubles. 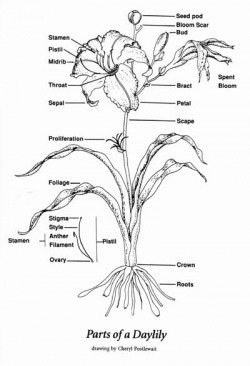 Useful as both specimens in your collector’s garden and mass plantings, there is a spot in every garden for a daylily! LANDSCAPING WITH DAYLILIES:Because of their low maintenance and because they do come back year after year, daylilies make great additions to any landscape. Use them as ground covers, to hold banks, as borders along fences and walks, and in decorative beds throughout the landscape. They also make attractive containerized displays. For the greatest impact in the landscape, plant your daylilies in groups of the same variety. By selecting daylilies that bloom and rebloom during different times of the season, you can get the most out of your daylily color palette. Sun: Daylilies love sun (full sun if possible) but will tolerate part-shade conditions. A general rule is to make sure they get at least 6 hours of direct sun a day. Many darker colored varieties will benefit from partial shade in the hottest part of the day. Soils: Daylilies will grow in a wide range of soils (from sand to heavy clay) and in a wide range of soil pH’s. There are steps you can take to improve your soil, especially if it is predominantly clay or sand. Clay soils can be improved by the addition of compost, humus or peat moss, or sand which will help to make it more friable. Sandy soil will benefit from the addition of compost, humus, or peat moss which will serve to increase water retention. 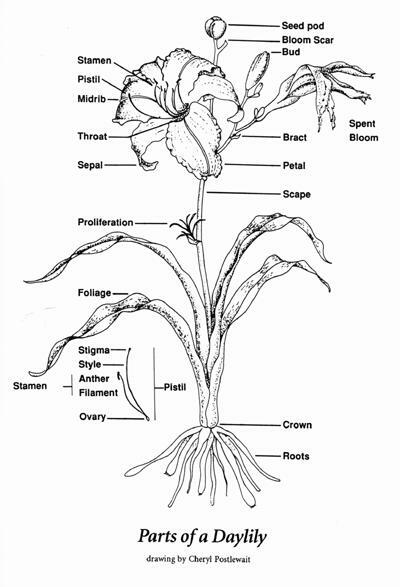 Other: To avoid root competition for water and nutrients, do not plant daylilies near shrubs or trees if possible. If you can’t avoid it, be sure and give them extra water and fertilizer to make up for what the other plants consume. HOW MUCH WATER? Water is essential for good performance. In sufficient quantity, water helps ensure that you get as many blooms and as large blooms as possible. It is most important that daylilies get sufficient water in the spring, when plants are making scapes and buds, and in summer during bloom season. Daylilies can withstand drought conditions, but you will notice decreased numbers of blooms and smaller bloom sizes. A general rule is to try and give your daylilies an inch of water every week. Fertilizer: Each garden has different soils with different nutrient needs. In general, daylilies are not picky about their fertilizer and for most home gardeners a complete balanced fertilizer such as 10-10-10 will do fine. When to apply? Wait until your newly planted daylilies are established (about two to three weeks) before you fertilize them. Generally, a single application in the spring is sufficient for most gardens, although some gardeners choose to fertilize again in the late summer or early fall. Mulch: Mulching can be beneficial to your daylilies in several ways. It can help by improving your soil through the addition of organic material, by helping to retain moisture, and by helping to discourage weeds. It can also help keep the soil cooler in the summer and provide protection against the cold in the winter. There are many good mulching materials you can use depending on what is available in your area. Wood chips, straw and pine needles are just a few possibilities. Weed Control: There are no easy answers to weeds, as any gardener knows. Daylilies are good at keeping weeds down once they are established, but until then, mulching and hoeing are good weed-control methods. There are various herbicides available for use around daylilies. Check with your local garden center or extension agent. Grooming: Many daylily growers remove the day’s bloom at the end of the day, called dead-heading, to give their gardens a neat appearance. It is not a requirement. Because of the intense summer heat in the South, the foliage on our daylilies often appears somewhat ragged towards the middle to end of the summer. Trimming the foliage with clippers, a weed-eater, or high-set lawn mower to about 6-10” will help to liven them up. This promotes the growth of fresh new foliage which keeps the plant looking nice until frost. During winter in cold areas, feel free to remove the dead foliage, but realize that you are removing the plant’s natural cold-insulator. If you do this, replace it with mulch if possible. Pests: Luckily, daylilies are not very susceptible to pests. Those that do bother them normally do only minor damage. Some of the more common pests are aphids, spider mites, thrips and slugs, and snails. These pests may cause bumps on the buds, discolored leaves, bent or twisted scapes, and ragged edges and holes on foliage. It is often difficult to tell what exactly is bothering your plant, and you may want to check with your local agricultural agent and have him test to determine the cause.